Sleeping at Soekarno Hatta Jakarta! Last few weeks been hectic at my work place... i just thinking and dreaming about my next holiday... whats next? what should i do? I had my bucket list.. i did my solo traveling for the very first time abroad to Malaysia in Jan 2007. 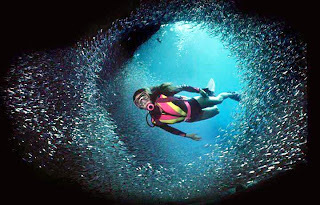 I did snorkeling also in 2007 for the very first time... i did bungee jump from the highest bungee in the world.. well at least that would last for sometimes... so... whats next? On the top of the list is "SURFING". Yes.... oh i think its very cool thing to ride wave!! i am not that good with balance, but i love roller skating (which is totally different..i know) but at least both depends on balance. But yeah.. i want to feel.. how is it feels like to stand on that board riding the waves! Where? Bali is on the top of the list... but ive been doing my browsing i had another options like Sumatra, Lampung not bad.. as well as West Sumatra! Lombok is always on my mind too! The "other world" that i want to see! Next on my list is "PADI OPEN WATER DIVING" yes... i had lots of ideas..i just think.. when i did the snorkeling i saw how amazing world under water... if only i could get closer! And alsO for my curiosity, what company are u working at? It seems nice, they let you travel a lot!! Its a good thing you had the list! it made me excited had "to do" things in my life, and its something that i really would like to do! Nahh.. you have to check the bungee operators first. I jump with AJ hackett they're already known for this bungee thing. First before i stood up at the edge yes its scary.. but when i stood at the edge of the platform, just about 1cm to the edge.. i feel..peace! I don't know about January, it will be quite busy month haha thats why i never travel in Dec-Jan! I work at an international oil and gas company. I work at field-not main office. We are not working with regular working hours and days. At field they had working sched, eg 14-14 or 20-10, 14-14 means 14 days working at field and 14 days off/holidays... so yes i had plenty time to went to places i wanted to! The bad thing is.. during those 14 or 20 days, if theres national holidays, like ied or xmast--you still have to work LIKE NORMAL! also we work on saturday and sunday.. no normal national holidays for us!